When luxurious cuisine meets with luscious wine, you know it’s time for the return of the 7th Annual San Diego Bay Wine & Food Festival. This November join the wave of epicureans taking over America’s Finest City in a week-long experience your tastebuds will never forget. November 17 -21. SAN DIEGO, CA (October 18, 2010) – The San Diego Bay Wine & Food Festival is pleased to announce its line-up of celebrity chefs appearing at the November 21st Celebrity Chef Luncheon, Presented by Wine Spectator, which includes Chef Roy Yamaguchi and Chef Jon Sloan of Roy’s, Chef Celestino Drago of Drago Ristorante, Chef Nico Chessa of Valentino, Chef Katsuya Fukushima of José Andrés Catering by Ridgewell’s, Chef Kenny Gilbert of Bravo TV’s Top ChefSeason 7, and Chef Ron Oliver of The Marine Room La Jolla. The luncheon is the culmination of a weeklong series of festivities, where nationally acclaimed chefs and legendary wineries come together to prepare a six-course meal paired with wines. Each table features a different winemaker or winery representative pouring a selection of fine wines from their portfolio. The prestigious list includes Domaine Serene, JUSTIN Vineyard & Winery, L’Aventure, Robert Biale Vineyards, Spring Mountain Vineyards, Laird Family Estates, Martinelli Winery, Wines of the Loire Valley, and others. Following the luncheon is the American Institute of Wine & Food’s Big Bottle Auction, a live auction that raises funds for the AIWF’s Culinary and Enology Scholarship Program. “We’re very excited to have such a talented line-up of chefs for this year’s Celebrity Chef Luncheon,” said Michelle Metter, co-producer of the San Diego Bay Wine & Food Festival. The Wine Spectator Celebrity Chef Luncheon & AIWF Big Bottle Auction takes place on Sunday, November 21 from 11:00 a.m. – 2:00 p.m. at Roy’s San Diego Waterfront. Celebrity Artist Christopher M. serves as host and emcee for the afternoon, while Master Sommelier Joseph Spellman will be on-hand to provide commentary during the live auction. Following the six-course food and wine pairing, the AIWF Big Bottle Auction begins, giving attendees the opportunity to bid on an array of items such as jet-setting vacation packages, large format bottles, and one-of-a-kind items that are perfect for the food and wine enthusiast. 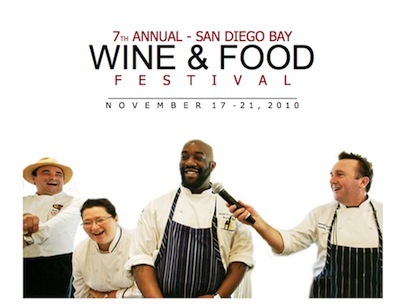 For a complete schedule of events for the November 17-21 San Diego Bay Wine & Food Festival, visit www.worldofwineevents.com.